Putting on a show that isn’t as well known as others can be a challenge to publicise. 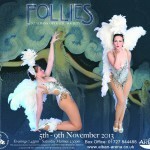 When we started to market our next show Follies, we realised just pushing out information about the show wouldn’t be enough. Fortunately, as I hoped, Jessie Smith put herself forward as Marketing & Publicity Team Leader, as we needed a more focussed effort going forward to promote Follies and our future shows. So what additional angle could we use to promote the show that would catch people’s attention? The answer was to have showgirls in costumes that don’t cover very much! A good friend of mine, Spike Brown from Blue Feather photography, offered to do a photo shoot of the showgirls in costume. As you will see from the pictures, he did an amazing job! 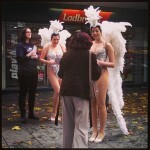 We had a great response from our showgirls and they pulled out all the poses they could think of. 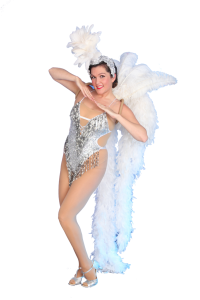 Over the past month or so, we have had articles in the Herts Advertiser, St Albans Review, St Albans Life and other magazines, plastering pictures of the showgirls wherever we can. So this blog is really about saying well done and a huge thank you to the showgirls for not only being prepared to wear these costumes on stage, but also to have their photos taken and spread around. If this wasn’t enough, some of the girls even walked around St Albans High Street handing out flyers last weekend. In this chilly October weather this was particularly brave of them – one girl even had her bottom pinched! So Let’s Hear it for the Girls!